Since 2013, we’ve been able to use handheld electronic devices such as the iPhone, iPad, and Kindle at pretty much all times during airplane flights, including takeoff and landing. That was a big change from previous FAA policy, which banned the use of personal electronic devices below 10,000 feet, forcing passengers to occupy themselves with books and magazines at the start and end of flights. Swipe up from the bottom of the screen to bring up Control Center, and tap the Airplane Mode button at the top left. Open the Settings app and enable the Airplane Mode switch that’s the very first option. When you land, use the same controls to turn it off again. What does airplane mode do? It disables the wireless features of your device to comply with airline regulations. Specifically, it turns off the cellular voice and data features of your iPhone or iPad, and on all iOS devices it turns off both Wi-Fi and Bluetooth. However, only the cellular features are important to your airline—you can re-enable both Wi-Fi and Bluetooth at any time. That might be useful if you want to use the airplane’s Wi-Fi network for Internet access (usually for a fee) or Bluetooth to play music over wireless headphones. 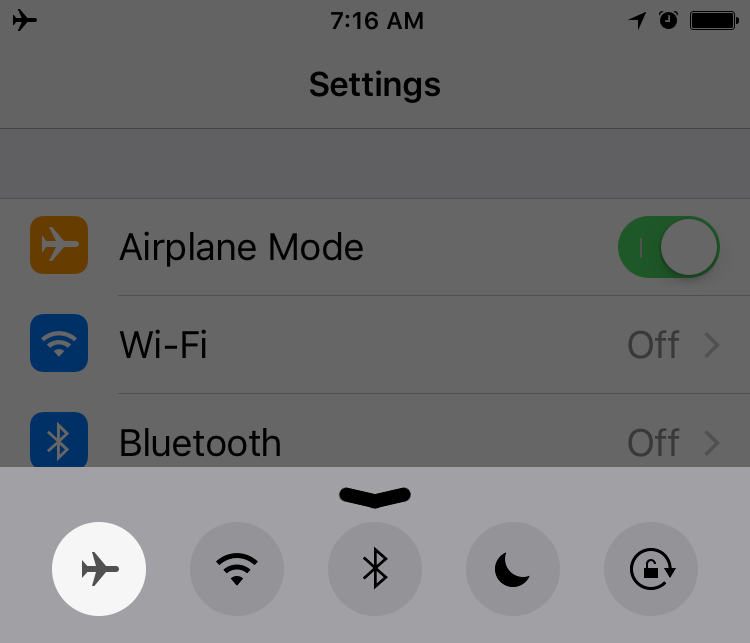 To turn these wireless features back on, tap the grayed-out Wi-Fi and Bluetooth buttons in Control Center, or flip their switches in Settings > Wi-Fi and Settings > Bluetooth. Don’t bother turning them on unless you’re going to use them, though, since you’ll save a little battery life by leaving them off for the duration of a long flight. Why do the airlines care about cellular? It has little to do with airplane safety; the prohibition on their use comes from the FCC, the Federal Communications Commission, not the Federal Aviation Administration. The reason is that fast-moving cell phones used high in the air may light up many cell towers at once, which can confuse the mobile phone network. The technical solution is akin to what the airlines do to provide Internet access now; a device called a “picocell” would be installed on the airplane to provide connectivity with the phone network, and cell phones on the plane would communicate with it instead of individual cell towers on the ground below. Will it happen, though? 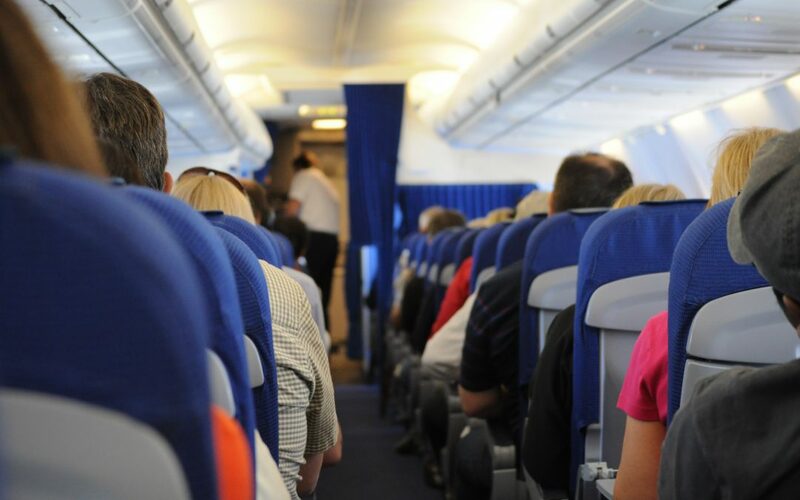 The FCC has proposed that it would allow cell phone use on properly equipped planes; however, the thought of fellow passengers having phone conversations during flight fills many people with dread. Many lawmakers in the United States oppose allowing passengers to make and receive phone calls during flight, citing concerns about cabin safety, a worry echoed by the flight attendants union. Even FCC Chairman Tom Wheeler has acknowledged this, saying “I get it. I don’t want the person in the seat next to me yapping at 35,000 feet any more than anyone else.” So don’t expect that rule to change. If you’re allowed to use Wi-Fi and Bluetooth, why do the airlines make you stow your MacBook Air during takeoff and landing? It has nothing to do with the technology—the airlines ban laptops during times when there could be an emergency landing because they could, like carry-on luggage or lowered tray tables, impede evacuation.